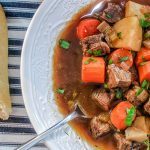 You can make this stew from scratch by starting with a nice beef chuck roast but I’ll tell ya what, this is an excellent recipe to use up leftover steak that’s never quite as good after it’s reheated. If you’re going to use a chuck roast, keep an eye on the sale ads in the newspapers, you can sometimes find it for less than the cost of bologna. 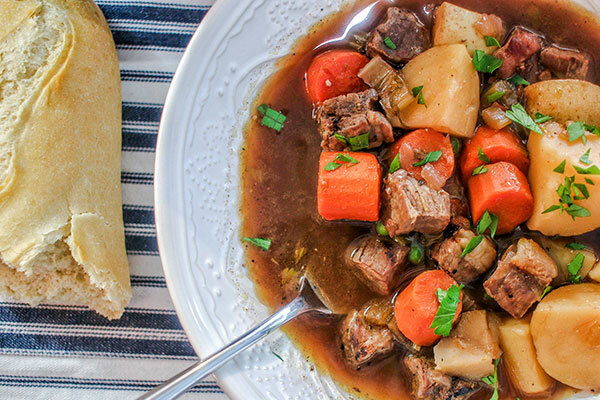 When I’m making this stew with a chuck roast, I like to smoke the roast before putting it in the stew for an added layer of flavor that just puts it over the top. 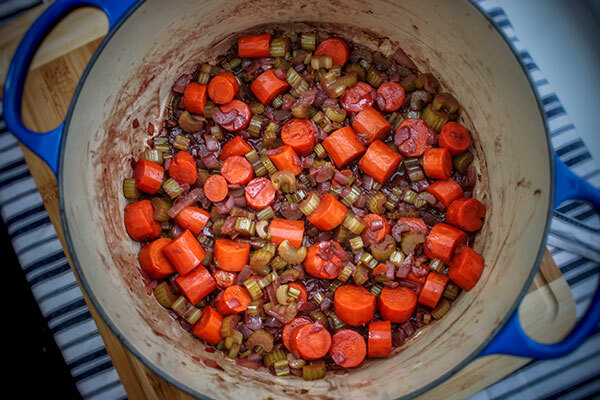 Today, however, we’re using up the leftovers and making a killer stew for the cold winter days. Perhaps the best thing about this dish is how the complex aromas of the veggies, beef stock, and wine permeate the kitchen as it simmers. I grew up eating a somewhat similar version of this with venison and vegetables that were harvested from our garden in the summer so the smells of it cooking bring back some great memories. Step 1: Peel and roughly chop onion, carrots, and celery. Dice potatoes into ½ inch squares. Step 2: In large Dutch oven, melt ½ stick of butter. Add the onions, carrots, and celery. Sauté vegetables for 10 minutes over medium heat. Season with a teaspoon of salt and a teaspoon of pepper. Step 3: Add one cup of red wine and reduce for 10 minutes, uncovered. I really like to use port wine for this (you can grab a cheap bottle for less than $7 at the grocery store), but any red will do. Just remember it’s going into a stew, so don’t use your finest vino. 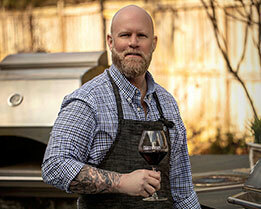 Your veggies will take on a dark color as the wine infuses into them. Step 4: Add beef stock, cream of mushroom soup, onion soup mix, and a bay leaves, then bring to a simmer. Cover and let simmer for an hour. 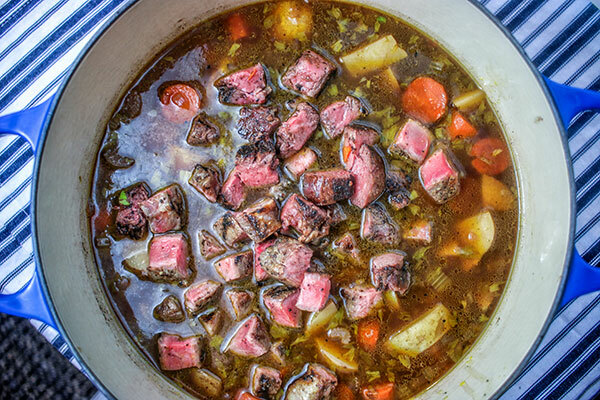 Step 5: While broth is simmering, cut steak into ½ inch cubes. Step 6: In a small mixing bowl, mix 2 tablespoons cornstarch and 2 tablespoons warm water. Slowly stir the mixture into broth to thicken. Step 7: Add potatoes and steak to soup and simmer for an additional 45 minutes. Step 8: Serve with crusty French bread, sourdough is also great with this soup. 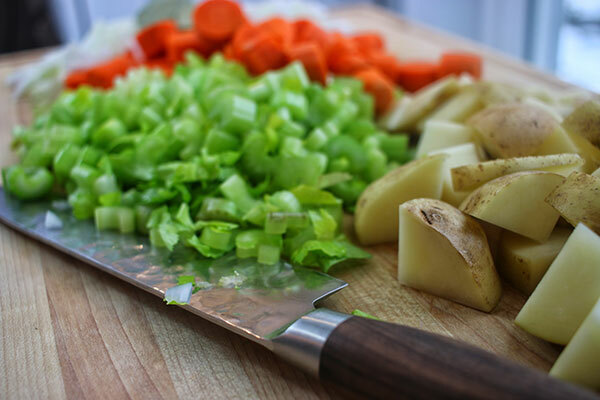 Peel and roughly chop onion, carrots, and celery. Dice potatoes into ½ inch squares. In large Dutch oven, melt ½ stick of butter. 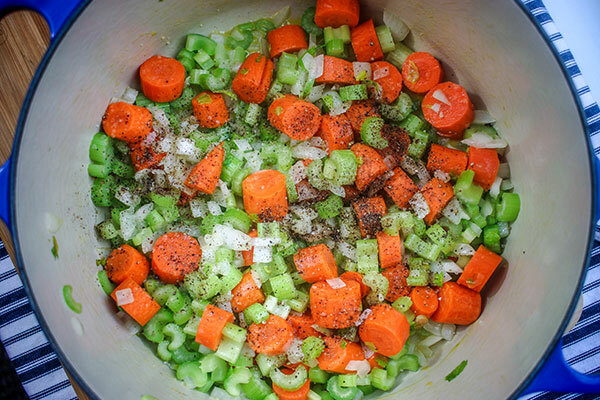 Add the onions, carrots, and celery. Sauté for 10 minutes over medium heat. Season with teaspoon of salt and a teaspoon of pepper. Add red wine, reduce for 10 minutes, uncovered. Add beef stock, cream of mushroom soup, onion soup mix, and a bay leaves, bring to a simmer. Cover and let simmer for an hour. 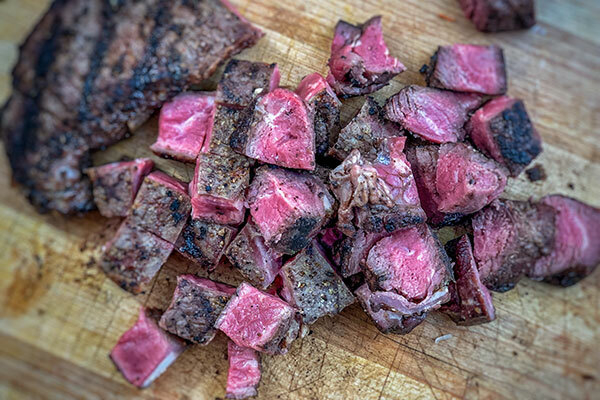 While broth is simmering, cut steak into ½ inch cubes. In a small mixing bowl, mix 2 tablespoons cornstarch and 2 tablespoons warm water. Slowly stir mixture into the broth to thicken. Add potatoes and steak, simmering for 45 minutes.